You’ve probably heard these words of advice before: “Just walk away when your child is trying to pull you into a fight.” And in fact, turning around and walking away is one of the most important things you can do as a parent to end power struggles with your kids. But what should you do when your child won’t let you walk away? You tell your 10-year-old daughter that she can’t have her friend over this Saturday and she is not happy. She begs and pleads, but you stand your ground. When she starts to escalate, you tell her you aren’t going to argue about it and you attempt to walk away. But then she comes unglued and starts crying hysterically. She tells you she hates you, then she grabs onto your arm, still pleading with you to change your mind. You know you need to get away, and you manage to make it to your bedroom and lock yourself inside. That’s when the screaming and banging on the door begin. You try to ignore it but eventually can’t take it anymore. You break down, open the door, completely lose your cool and scream at her. When you walk away you “win”—and your child doesn’t want that to happen, so he will try almost anything to keep it going, whether it’s calling you names, throwing things, punching a hole in the wall, or slamming a door. You pick your teen son up from school and inform him that his cell phone has been shut off for 24 hours because he was on the phone past his bedtime the night before. He unleashes a verbal assault on you and you tell him to stop. He demands that you turn his phone back on immediately, and when you stay silent, he blows up. He leans over and yells in your face while you’re holding onto the steering wheel of the car with white knuckles, trying to focus on getting home safely. When you continue to ignore him, he takes his cell phone and throws it as hard as he can into the back seat of the car. You can’t control yourself any longer so you yell at him and tell him he’s lost the phone for a month now. You pull into the driveway feeling horrible. Disengaging is one of the best ways to stop power struggles from happening or arguments from continuing. But many kids—particularly defiant, oppositional ones—will follow their parents around, prolonging the argument. Why do they do this? When you walk away or stop participating in an argument, you send your child the message that you’re in control. Though they aren’t consciously aware of all of this, they feel the power shift from them to you, so if they can pull you back into the argument they can regain that control they lost. When you walk away you “win”—and they don’t want that to happen, so they will try almost anything to keep it going, whether it’s calling you names, throwing things, punching a hole in the wall, or slamming a door. If they can do something that gets you to react, they feel a whole lot better. And in many cases, they know that if they push all the right buttons, you just might give in to get relief from the torment. There are several common scenarios we hear about from parents in eCoaching. Let’s take a look at each and talk about what to do. Here’s the trick: Once you walk away, say no more. Lock the door and ride out the storm. If your child is screaming outside your door or pounding on it with all their might, ignore them. Do whatever you can to cope until they’ve calmed down. The second you turn that door knob to tell them to stop, you’ve given them what they wanted. Put on some headphones, turn up the TV, read a book, knit. Do whatever you have to do to focus your attention away from your child’s behavior. If they damage something or call you foul names while they’re pounding on your door, give them consequences afterward, when they’ve calmed down—and stick to them. In other words, ignore their attempts to pull you in when you’re disengaging from them, but hold them accountable for anything they damage (or rules they break) later. If your child goes to her own room and starts to throw things around or screams at the top of her lungs about what a jerk you are or how much she hates you, let her. If she breaks something of her own, that’s a natural consequence. She will have to buy her own replacement or do some chores to earn the money to buy a new one. If she makes a mess of the room, she will have to clean it up later when things calm down. It’s more effective to focus on controlling yourself and your emotions rather than your child’s behavior. If the argument is over the phone or via text message, tell your child that you’re done with the discussion and you will not reply anymore. Then, follow through. Turn the phone off, or unplug it if it’s a landline and get involved with something else. You can finish talking later when things are calm again. This is one of the most difficult places to get into an argument with your child. The first rule is, pull over. You may not be able to walk away, but you might be able to step outside the car to get some fresh air if it’s safe to do so. Or, you can tell your child you’re not going to continue on until they calm down, because it’s not safe for you to drive while they’re verbally abusing you or acting disruptive. Then, find something to do that will help you cope. This might take some planning ahead, such as packing a book or magazine (or keeping something like that in your glove compartment) that you can pull out and use in these cases. Let’s say, for example, that you‘re cooking dinner. Set one limit with your child and then do what you can to focus your attention on the task at hand, not your child. Avoid eye contact and ignore comments he makes under his breath. Find some sort of mental task to occupy your mind, such as counting or singing a song to yourself in your head. If you have a relatively compliant child who will go to his room when asked, you can tell him to do so, but if your child is like most, he will refuse. Since you can’t make him go, the best thing to do is not pay attention to him. The key is to avoid giving his behavior any power. Control what you can—yourself. This is perhaps the most difficult situation to find yourself in when you try to walk away. It’s very important that you stay calm, use a normal tone of voice, and tell your child this behavior is not okay, while redirecting them to go do something to calm down. They’re probably going to stick around, though—at least at first. Continue to remain calm and wait it out. Yes, this might mean that you literally stand there and wait. You could also let your child know that they need to stop or there will be a consequence later. If your child is not blocking your path, try your best to go about your business—do the dishes, read a book, or surf the internet. The goal is to find some sort of task to focus on so your attention is not on your child’s behavior. For children who are pre-school age or younger, or who have developmental delays or disabilities that cause them to function at 4 years of age or younger, walking away as described in this article may not be effective. Disengaging and moving too far away from a child at this developmental level may cause anxiety. If this is the case with your child, it might be better to try to stay close by within your child’s sight. It can be really helpful to say something like this: “You’re so upset. I wish I could help you calm down. Why don’t you…” and then suggest a calming activity for them to do. This might be looking at a book, playing some music they like, or playing with a favorite toy. You can model how to stay calm and you can disengage without leaving the room altogether. Before you walk away, it’s always helpful to set a limit with your child and attempt to redirect them. For example, “I’m going to go take a break. You should go listen to some music or do something to calm down.” Another example is, “Yelling at me isn’t going to get you what you want. When you calm down, we can talk more. I’ll check on you in 15 minutes and see if you’re ready.” Also, if your child has younger siblings in the home, take them with you when you walk away so they don’t become a target or a pawn that your child can use to pull you back into the argument. If your child has older siblings, you might tell them to go to their rooms until your child calms down. The smaller the audience is, (or the number of potential targets) the better. Once you’ve walked away, be aware of any potential safety issues or needs for local supports. If it sounds like your child is being incredibly destructive to your home, it might be a good idea to call the police instead of trying to stop him yourself. Oftentimes, we suggest that parents call the non-emergency number for their local police department ahead of time to discuss how they would handle these kinds of situations if you should call them for assistance. This way, you have an idea of what you’d be getting into and you can make an informed decision. If your child threatens to hurt themselves or someone else, that’s another situation in which you will need to utilize some local supports, such as the police or a local crisis helpline. When the safety of your child, or another family member, is at risk, you absolutely want to step back in there in some way and make sure everyone is safe. It has been shown that over time, when a behavior is no longer reinforced or rewarded, it will eventually fade away—also referred to as “extinction.” To put it another way, if the behavior doesn’t get what it needs to survive—your attention—it will eventually cease to exist. The key is to be consistent. If you continue to feed the behavior, even just once in a while, the behavior will continue to rear its ugly head. 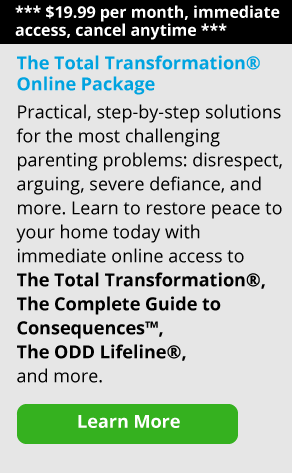 It takes a lot of time, energy, and practice and it will be very exhausting, but do your best to consistently ignore your child’s attempts to pull you back into the argument after you’ve disengaged. Over time your kids will see that you mean it when you walk away—and they will learn they can’t pull you back in. This change in your response will lead your child to adapt or to find new (and hopefully more appropriate) ways of coping.